Never in my life would I have imagined that there would be a sell-out crowd at Theatre Aquarius on a Friday afternoon, and so it was with great leisure that I strolled down the street imagining a private viewing of this first runner-up for the New Play Contest, The Bootlegger's Wife. Quickly I found out that I had received the second-last ticket along with Carla Garcia from Rise of the Prickly Pear (read the RTH review). Lucky! 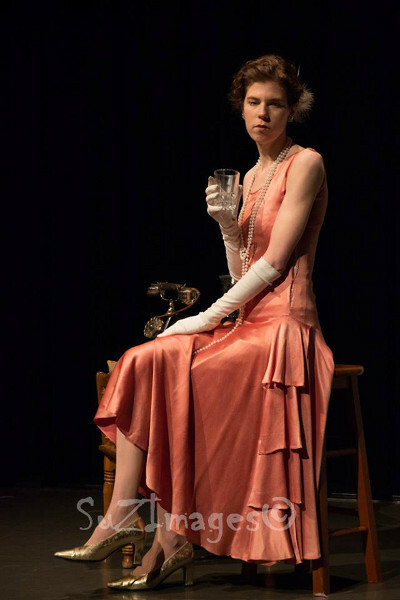 At any rate, Victoria Murdoch masterfully portrays Bessie Starkman, the lover and business partner of Prohibition-era rum-runner (and Hamiltontian!) Rocco Perri. She comes across as a hard-nosed sophisticated business woman who takes no nonsense. Despite the abuse and the constant weirdness, though, she cannot help but admit that this is a far more interesting life than it could have been. She is surrounded by titans of industry, finds herself called in for questioning on multiple occasions, and enjoys a luxurious 19-room palace that she has created with this operation. Nonetheless, she also seems to long for the simplicity of a nice night with her husband free of drama. Like many plays in the Fringe, this is a one-woman show using sound effects to bring in other characters so we can hear Rocco or the interrogators. Also, the news clips were fantastic as they really set a mood. I imagined a much, much simpler time. Not being originally from Hamilton, I was unaware of this tale. The only thing that would have improved the experience was if they handed out authentic shots of whatever moonshine she was peddling! Thanks so much for this review Mackenzie! It was such a pleasure to have you in the house! Cheers!